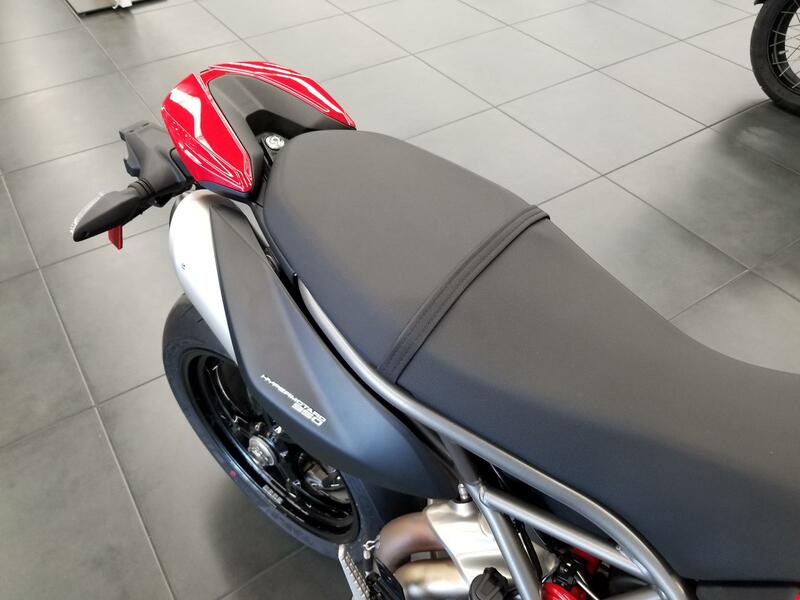 NEW HYPER NOW IN STOCK! 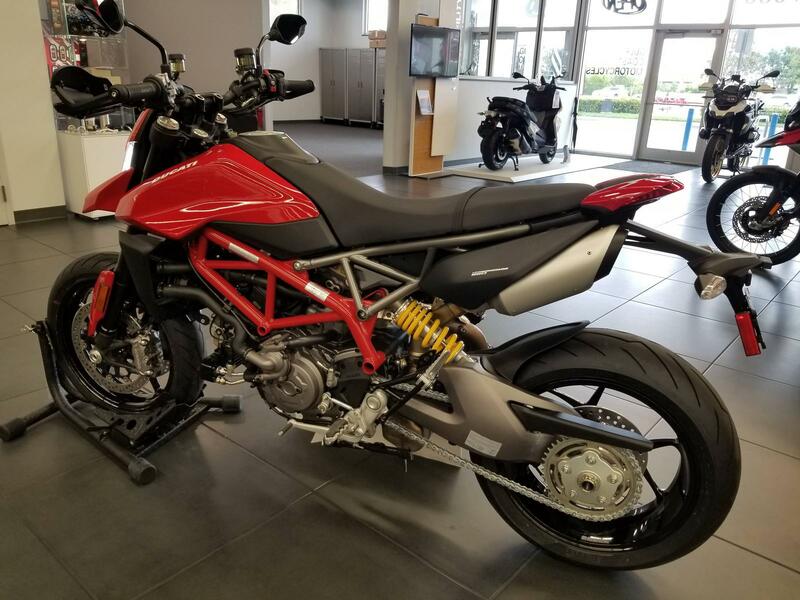 Motard style: The new Hypermotard perfectly combines such distinctive features of the Hypermotard 1100 as minimalism, aggressiveness, lightweight look and a "fun-bike" image with the innovation and technology of Ducati's latest generation models. 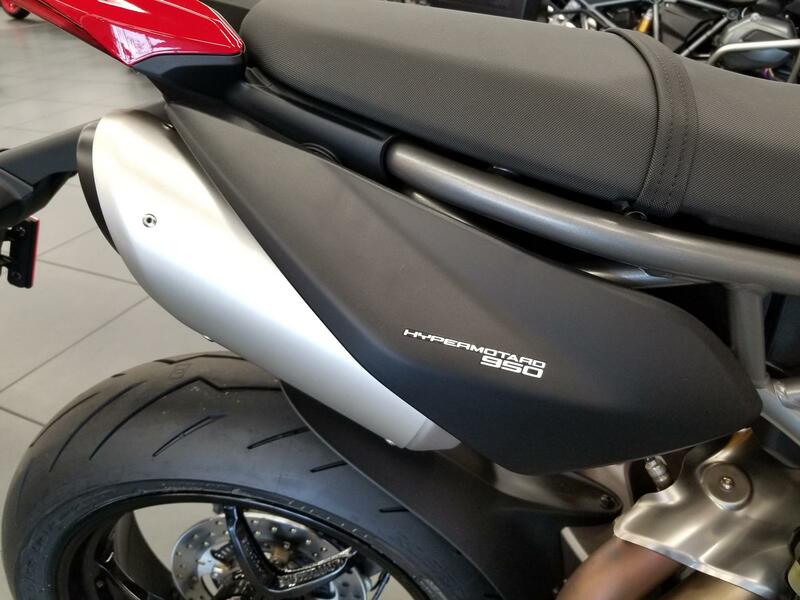 Fun to the Nth degree: The riding position has been thoroughly revised for the utmost riding fun and control. 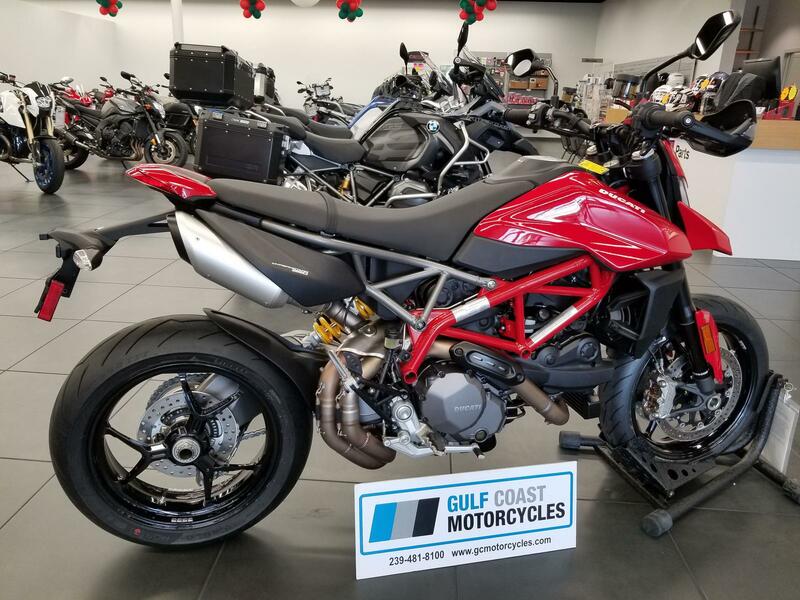 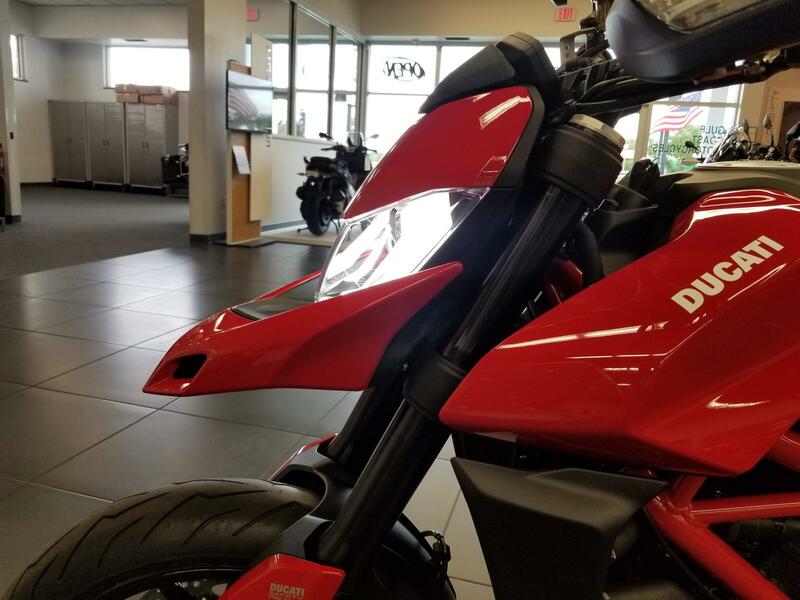 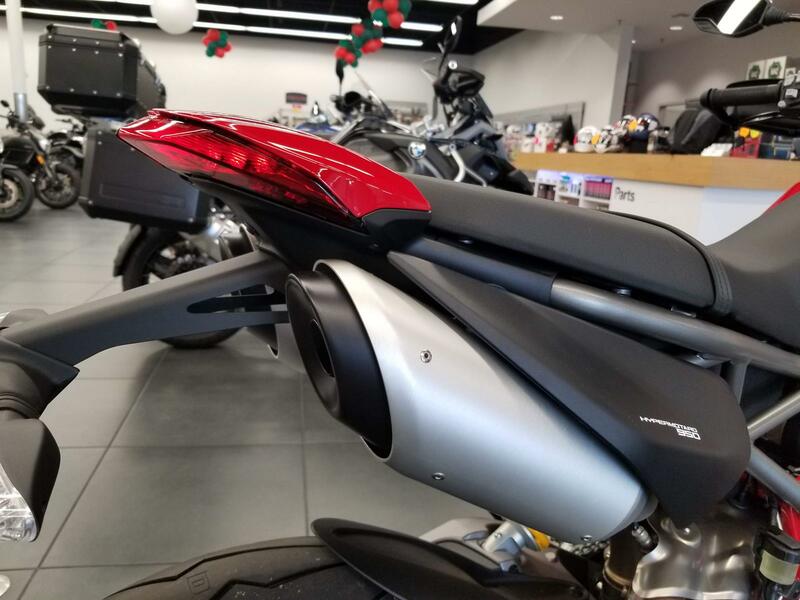 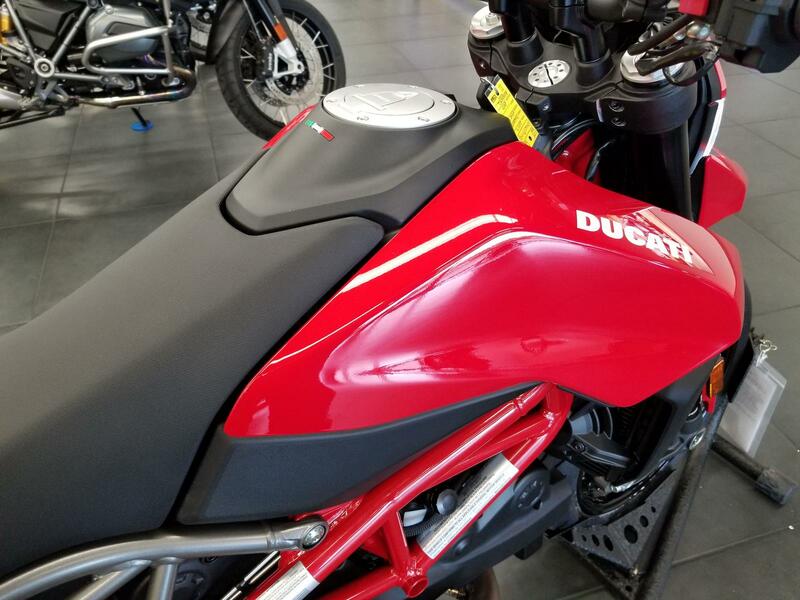 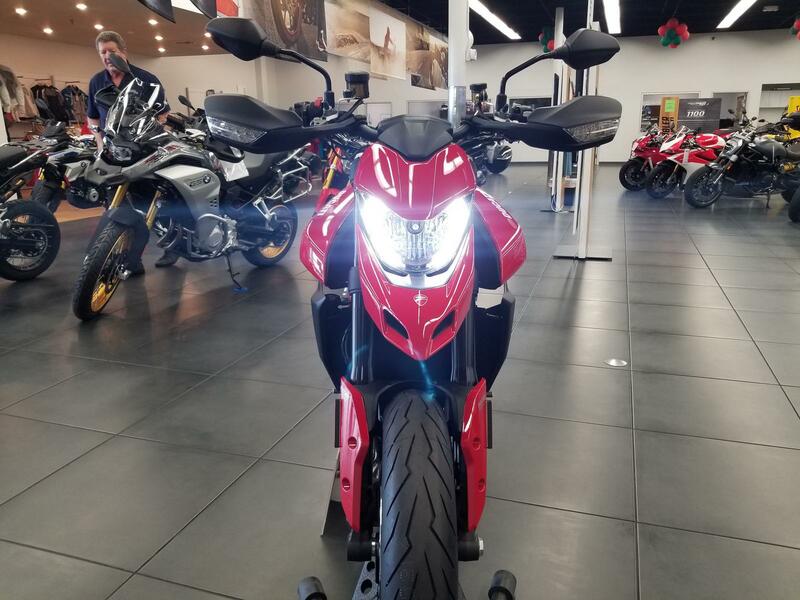 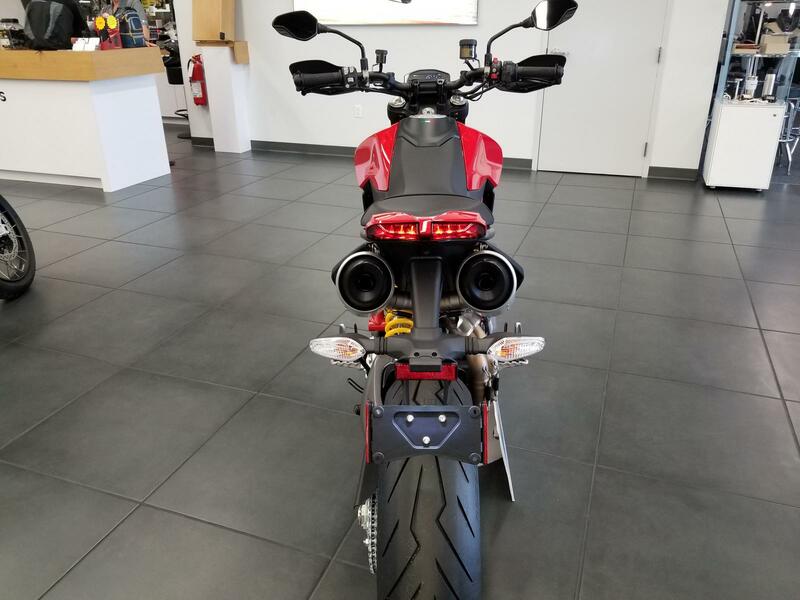 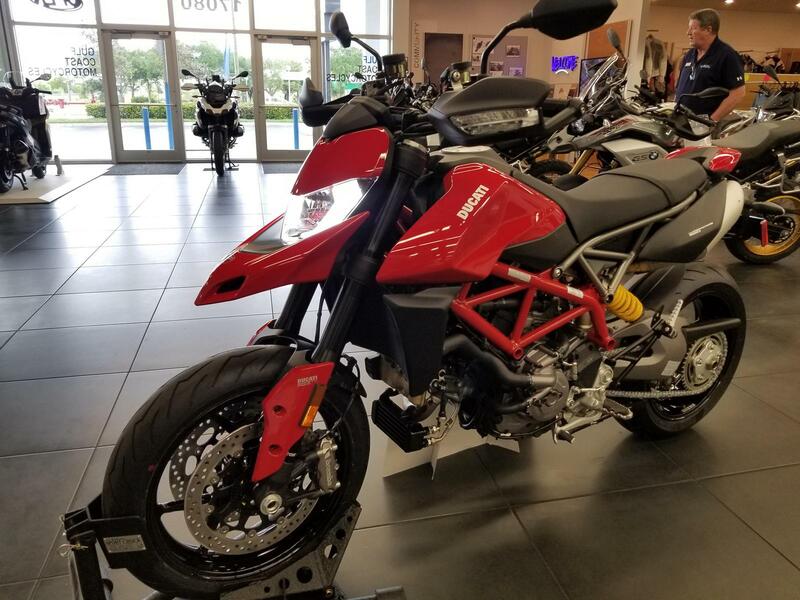 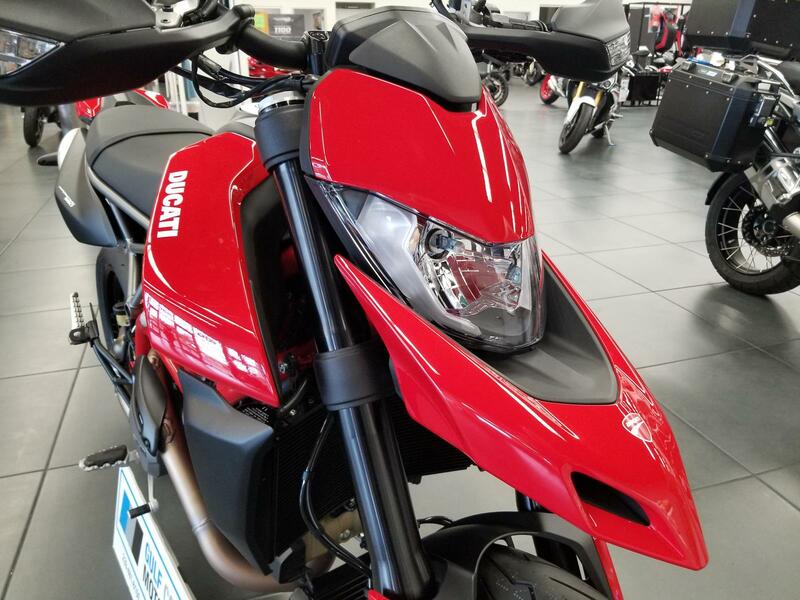 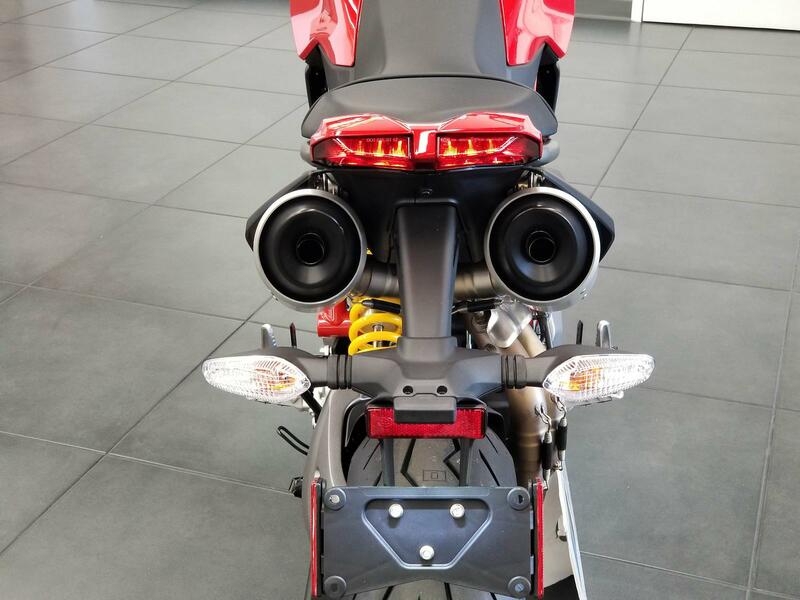 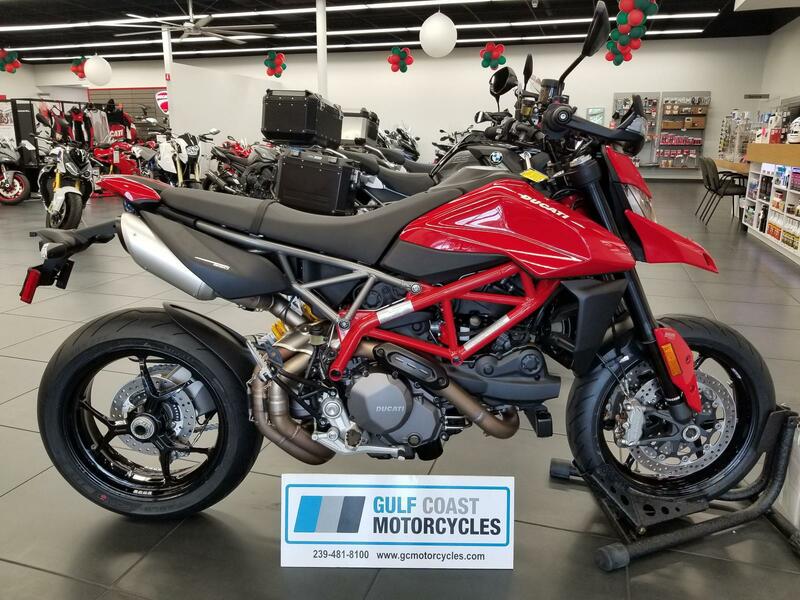 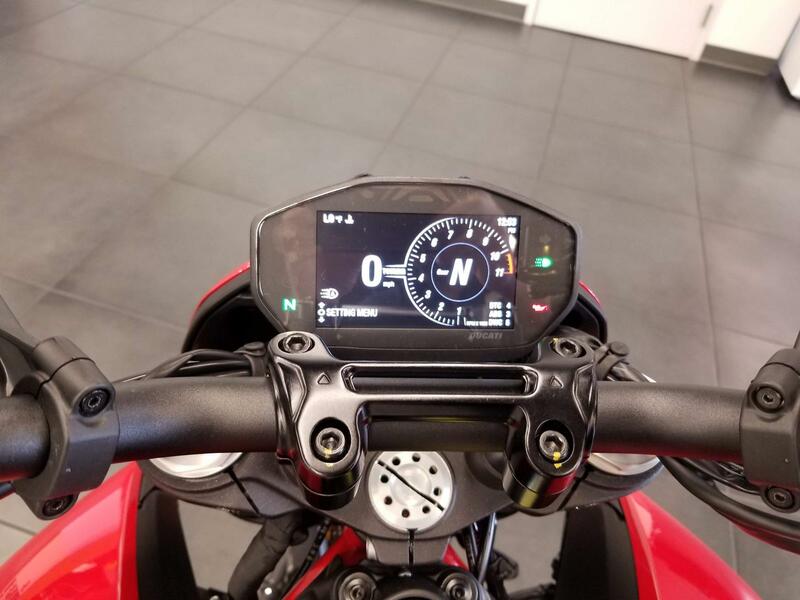 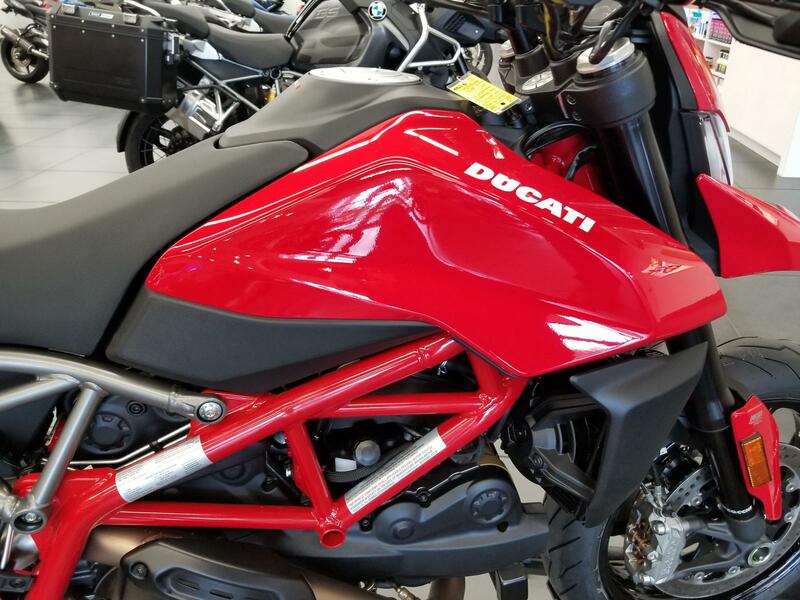 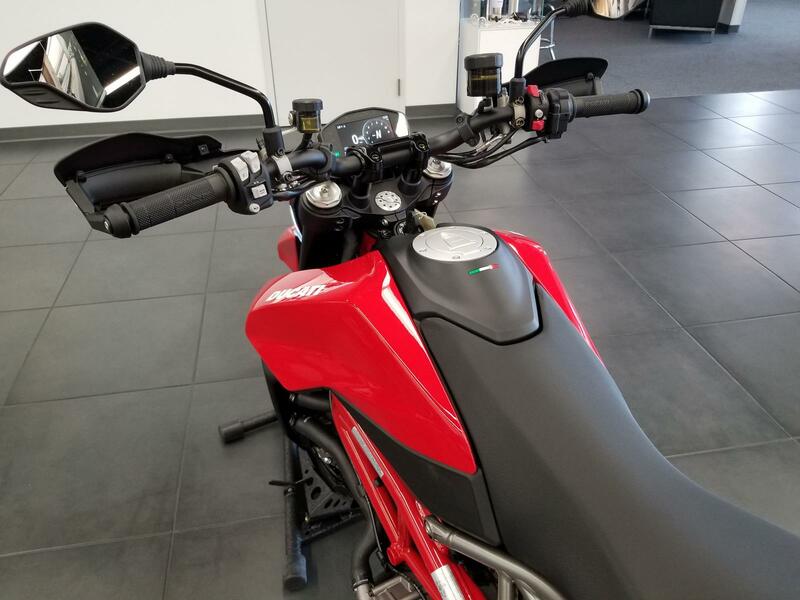 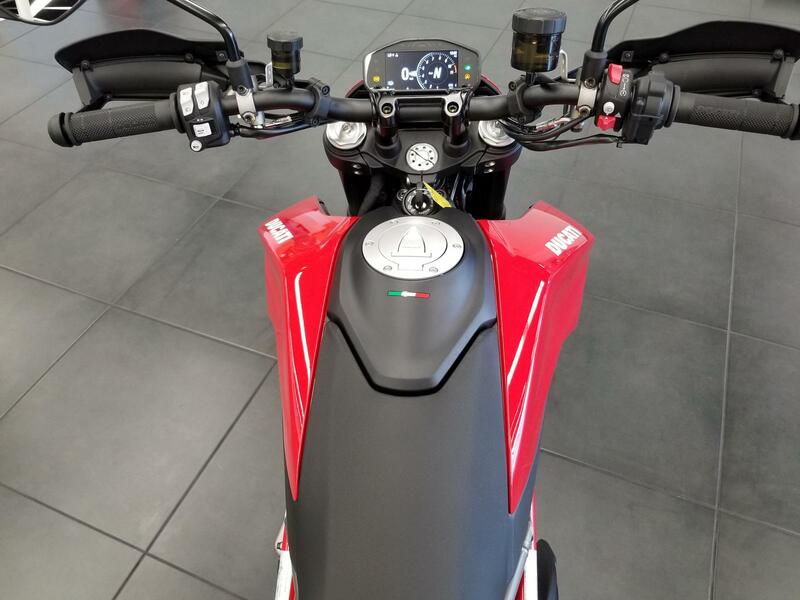 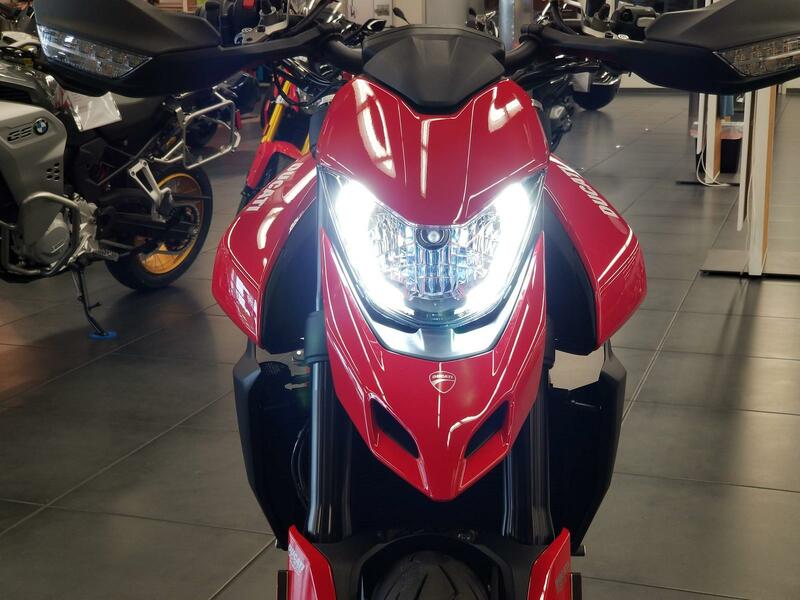 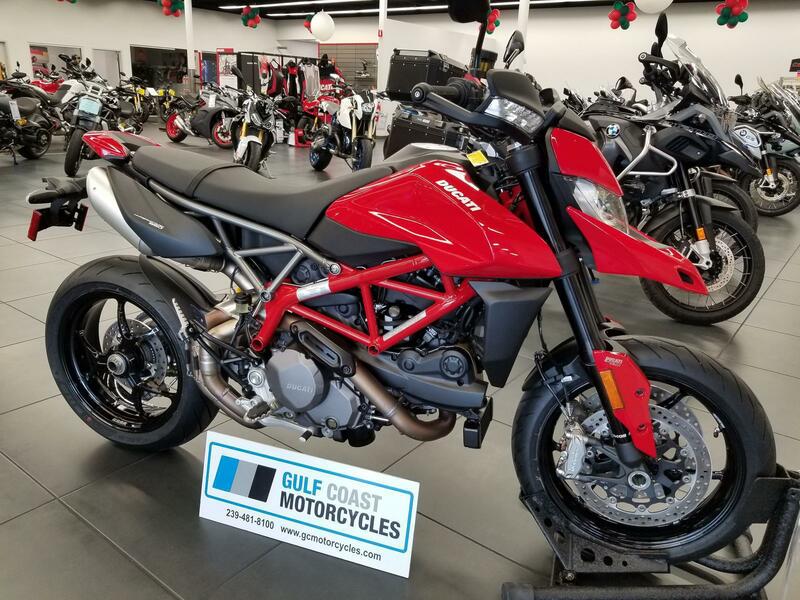 The new Hypermotard 950 sports a new, more open handlebar, narrower side profile and a new Hypermotard 950 seat, featuring a flat, extended profile and a moderate bulge in the passenger area for improved comfort. 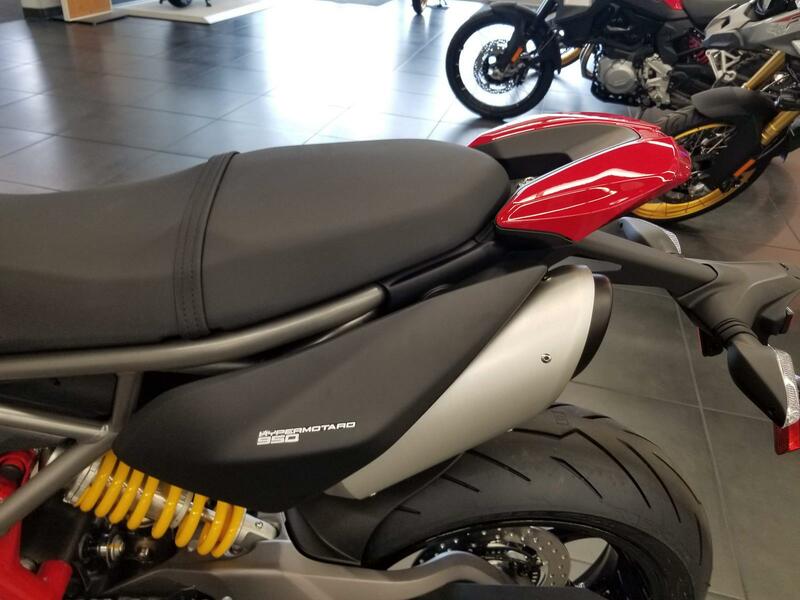 The SP version seat is flat, in line with the motard style, to facilitate shifting forward and backward on the seat while riding. 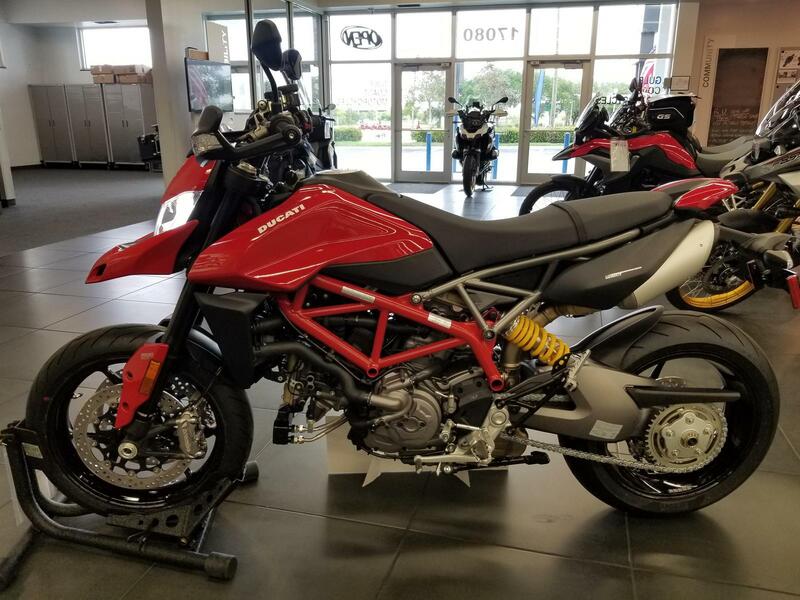 Ducati Testastretta 11°: The Hypermotard 950 family is equipped with a revised version of the 937 cu cm twin-cylinder Ducati Testastretta 11°. 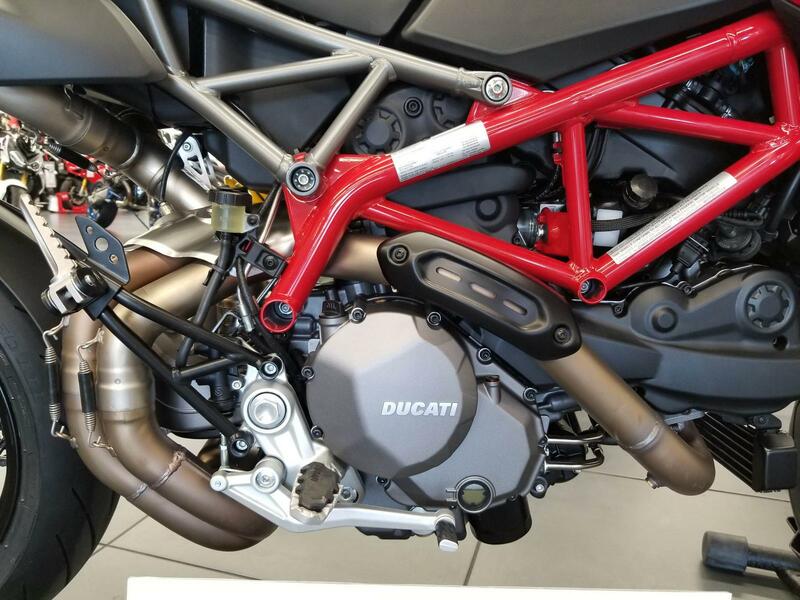 The twin-cylinder engine has been radically revised (and lightened by 1.5 kg). 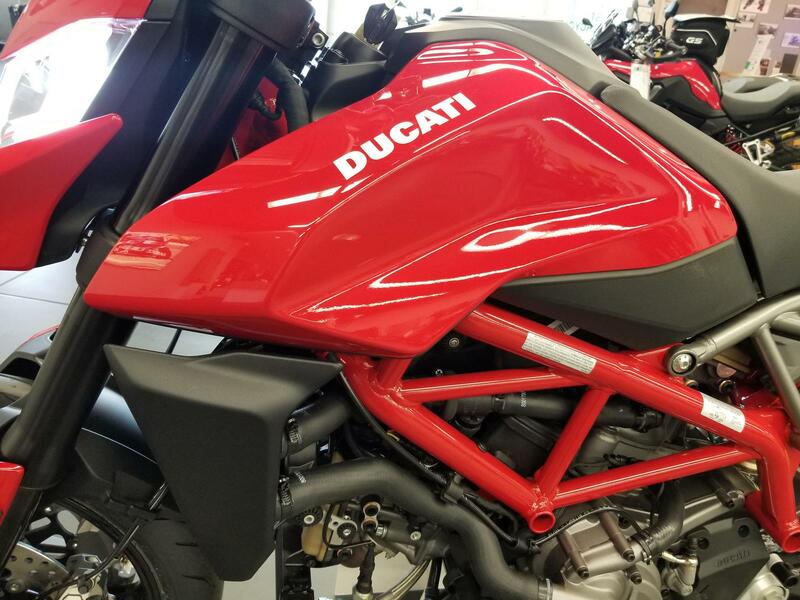 It outputs 4 more horsepower than its predecessor, achieving 114 hp at 9,000 rpm and a flat torque curve peaking at 9.8 kgm at 7,250 rpm. 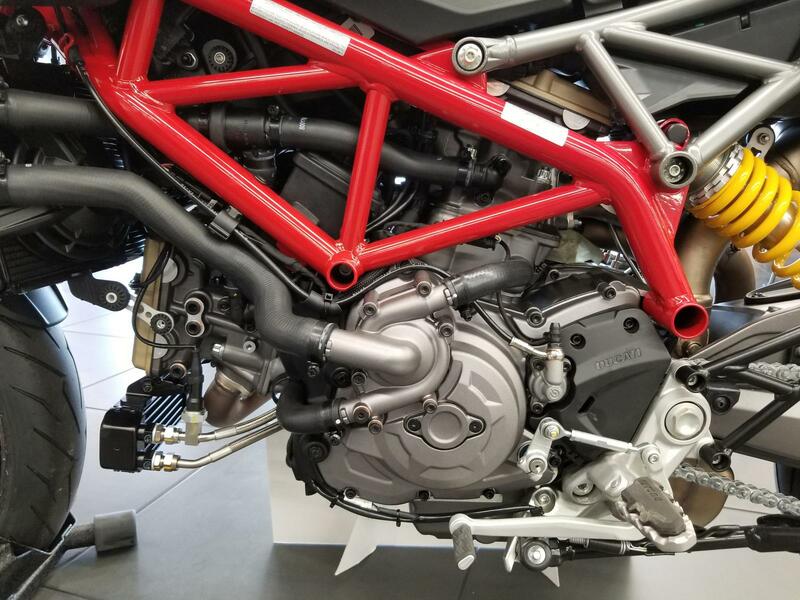 Non-stop emotions: Thanks to Ducati's constant attention to quality, the 937 cc Testastretta 11° engine allows optimal maintenance management: valve adjustment is scheduled every 30,000 km. 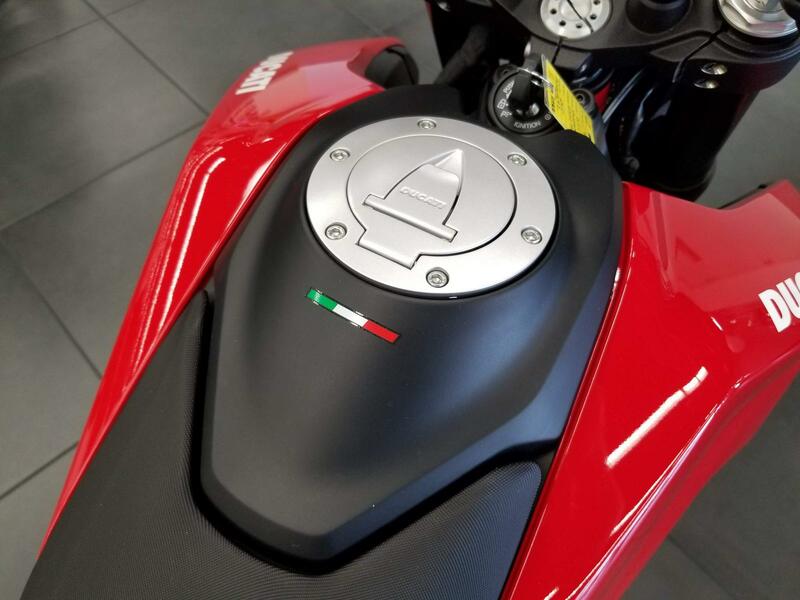 Type: Testastretta 11°, L-Twin cylinder, 4 valve per cylinder, Desmodromic, liquid cooled, magnesium head covers. 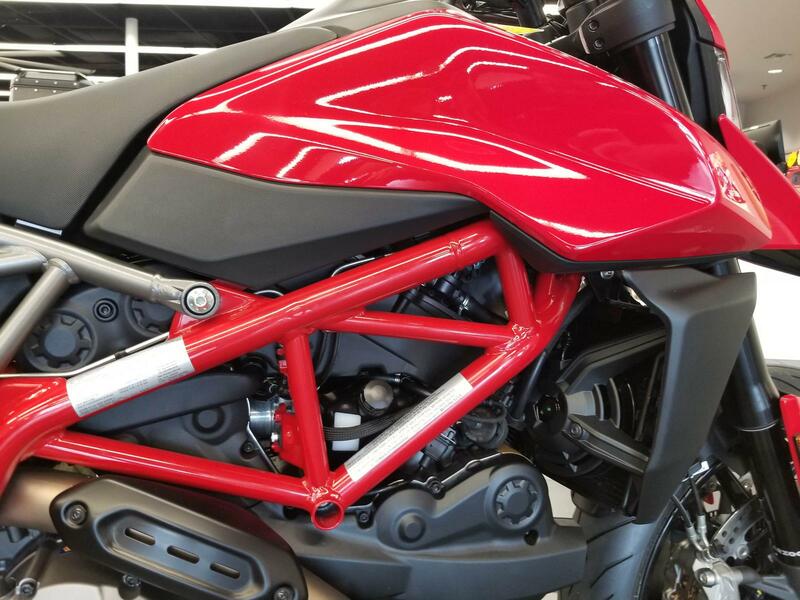 Fuel injection: Electronic fuel injection system, Ø 53 mm throttle bodies with full Ride by Wire system. 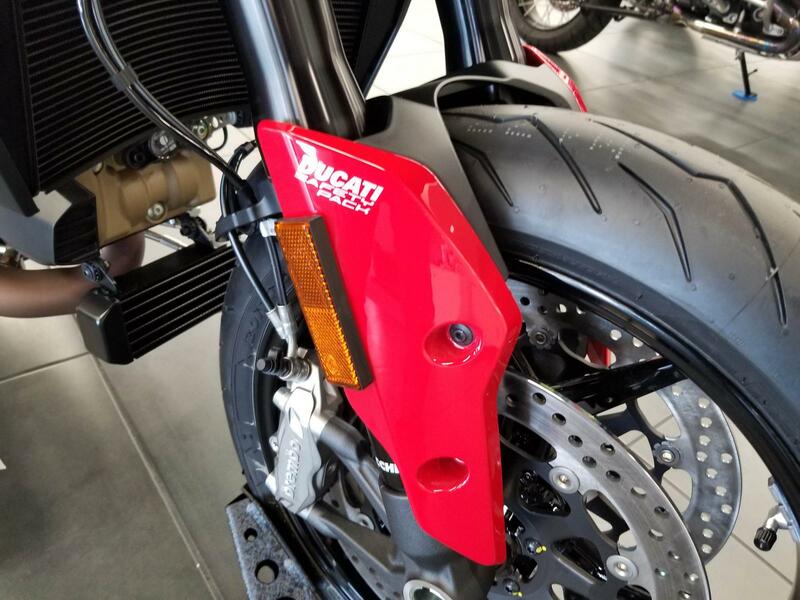 Exhaust: Double under-tail aluminum muffler; catalytic converter and two lambda probes. 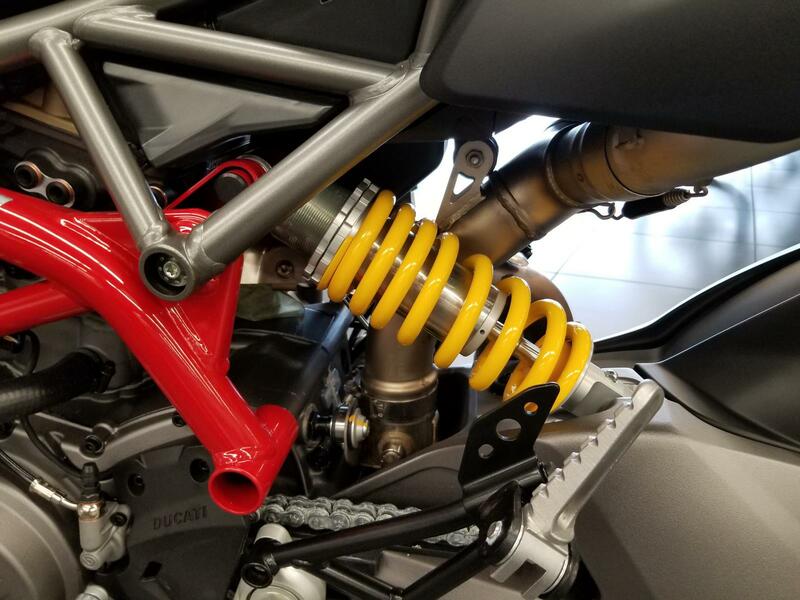 Front suspension: Marzocchi aluminum fully adjustable, upside-down Ø 45 mm. 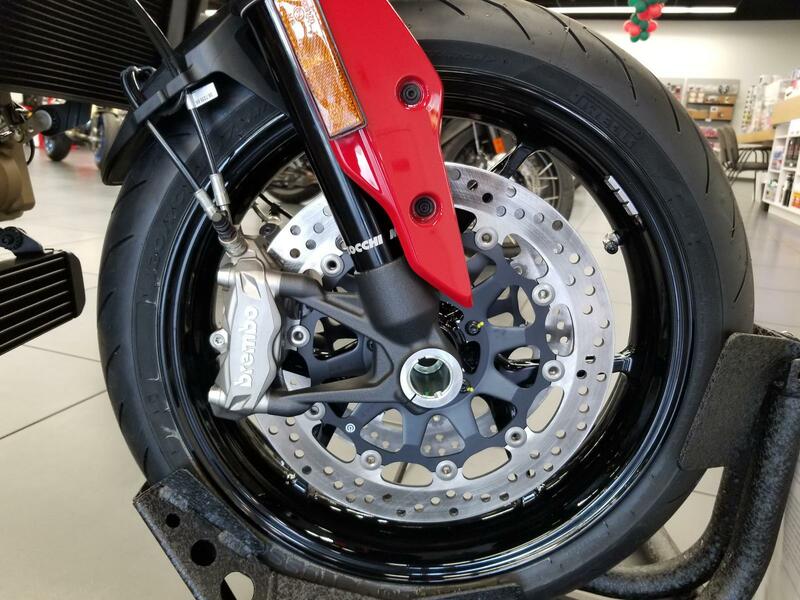 Rear suspension: Progressive linkage with adjustable spring preload and rebound damping Sachs monoshock. 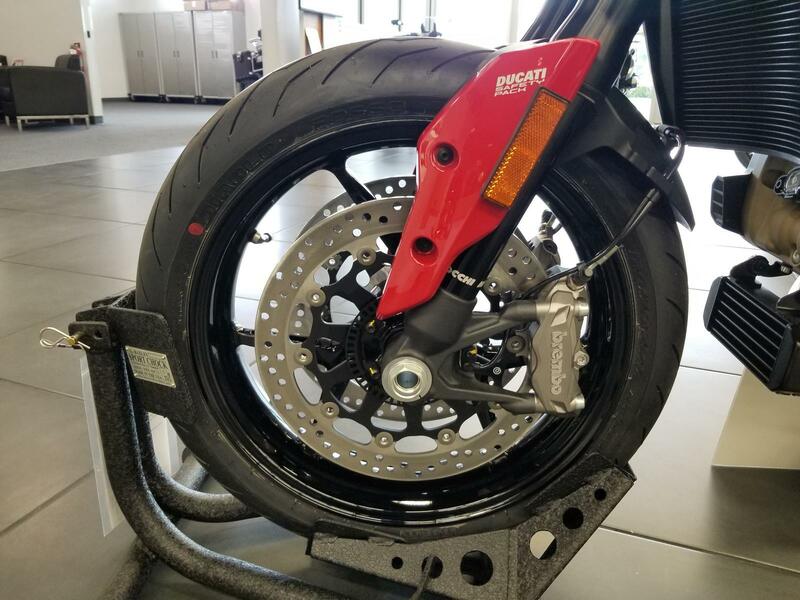 Aluminium single-sided swingarm. 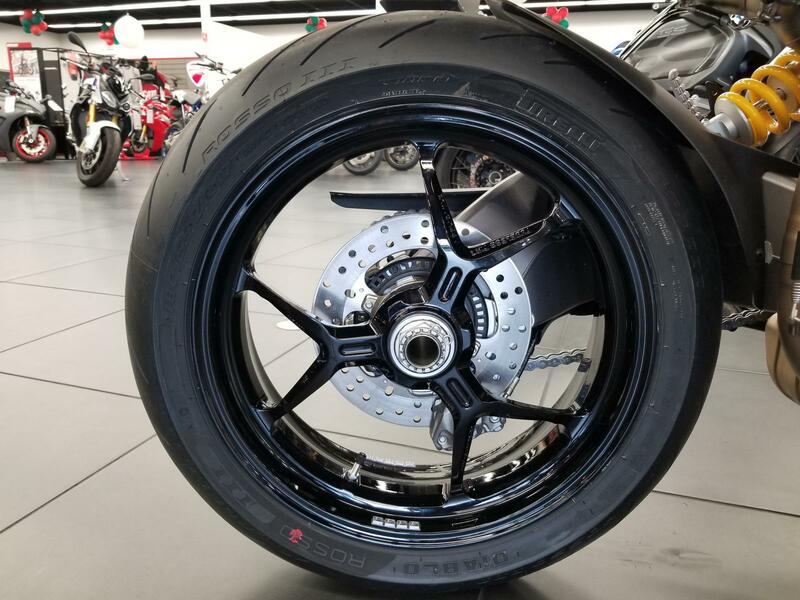 Rear wheel: Y shaped 3-spoke light alloy 5.5" x 17"
Front brake: 2 x 320 mm semi-floating aluminum flange discs, radially mounted Monobloc Brembo callipers, 4-piston 2-pad, radial pump with adjustable lever, with Bosch Cornering ABS. 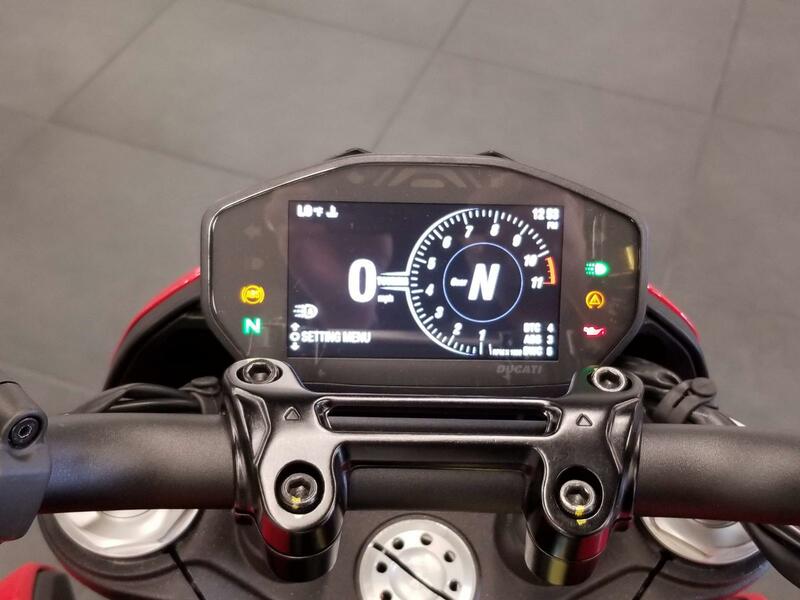 Safety equipment: Riding Modes, Bosch Cornering ABS , Ducati Traction Control (DTC) EVO, Ducati Wheelie Control (DWC) EVO. 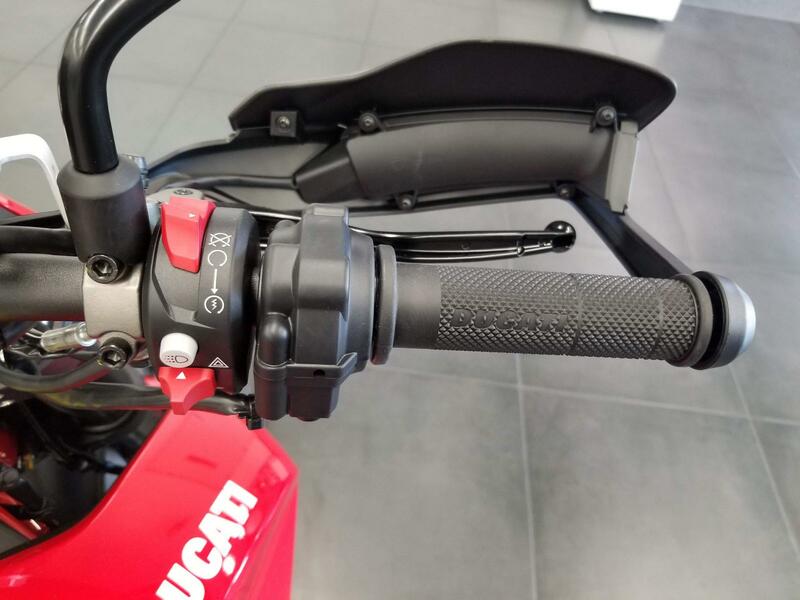 Marzocchi aluminum fully adjustable, upside-down Ø 45 mm. 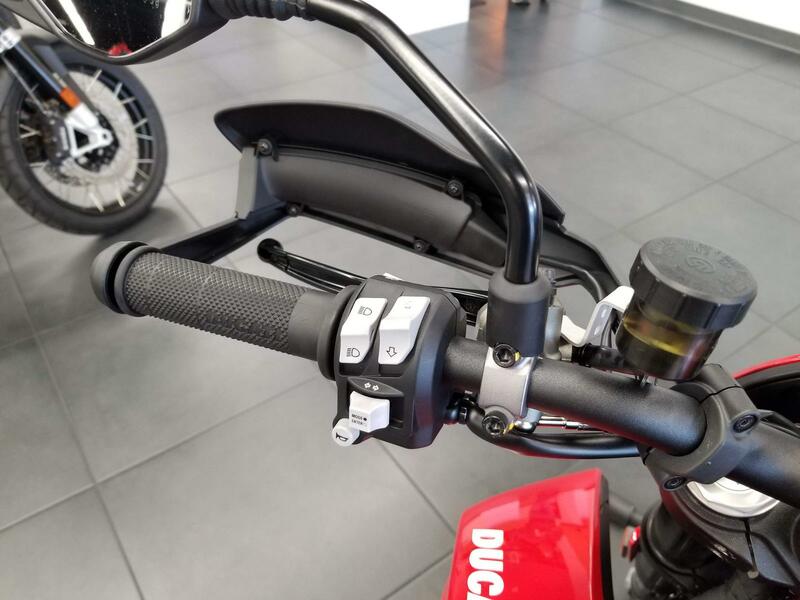 Progressive linkage with adjustable spring preload and rebound damping Sachs monoshock. 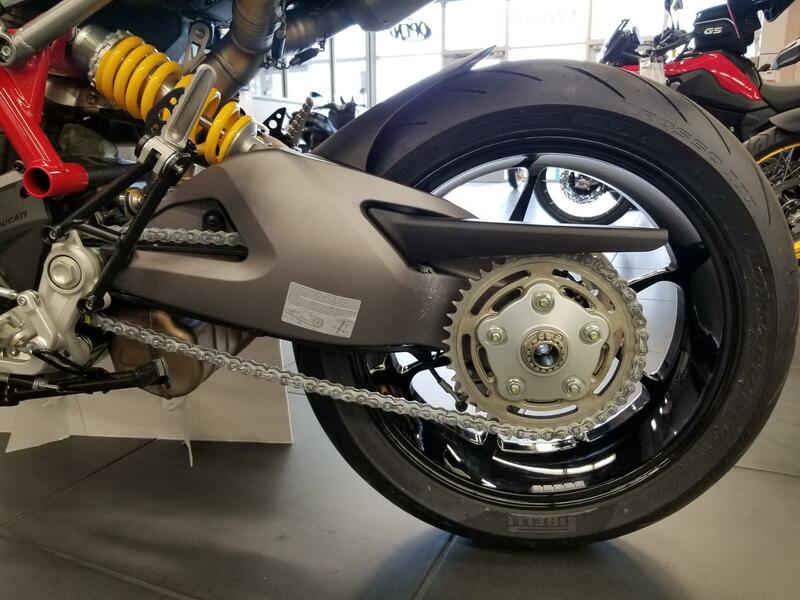 Aluminium single-sided swingarm.